The High-Resolution Continuum Source AAS technology (HR-CS AAS) now also enables the detection of non-metals using an AAS instrument, the contrAA from Analytik Jena: Thanks to a Xenon lamp as continuous radiation source, any wavelength is available for measurement on the contrAA - including molecular bands. By converting the non-metals into characteristic molecules, these can be detected using molecular absorption spectrometry (MAS). 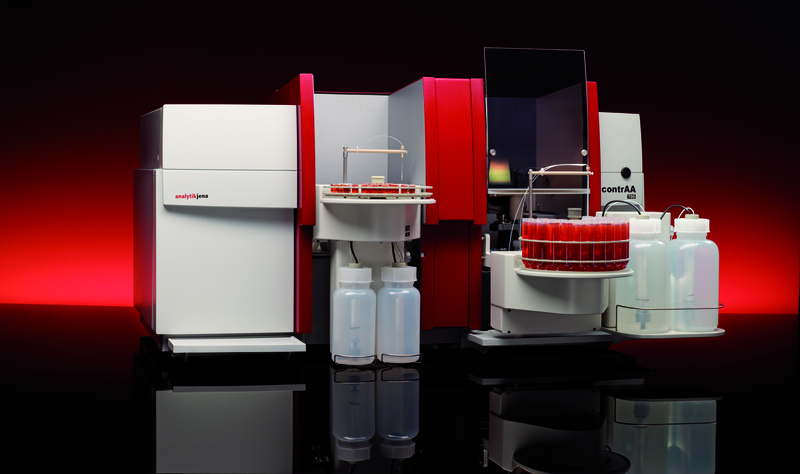 HR-CS MAS is a new robust method for the selective analysis of the individual non-metals in aqueous and organic solutions and directly in solids - independent of the type of chemical bonding. Without extensive sample preparation the non-metals in the graphite furnace are converted quantitatively into the target molecule and then detected by way of spectrometry. It does not matter whether the non-metals are free anions or organically or inorganically bound in the sample. Thus a simple, fast and reliable spectrometric method for the detection of non-metals in almost any matrix and across a wide range of concentrations is available for the first time, eg of fluorine in water or toothpaste or of phosphorus in animal feed or seepage water. Graphite furnace HR-CS MAS is as precise, robust and interference-free as graphite furnace AAS and not subject to any limitations regarding the chemical bonding, the pH value, the solvent or the sample matrix, reducing the sample preparation to a minimum. HR-CS MAS - yet another innovation from the technology leader in Jena!